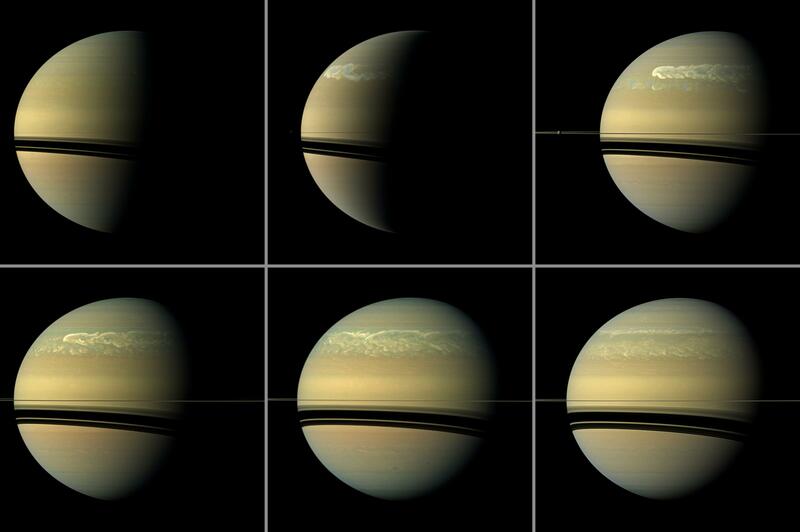 This series of images from NASA's Cassini spacecraft shows the development of the largest storm seen on the planet since 1990. These true-color and composite near-true-color views chronicle the storm from its start in late 2010 through mid-2011, showing how the distinct head of the storm quickly grew large but eventually became engulfed by the storm's tail. The earliest image of the storm, taken Dec. 5, 2010, is in the top left of the panel. The storm appears only as a small, white cloud on the terminator between the day side and night side of the planet. See PIA14902 for a magnified view of the storm at this time. The next view, in the top middle of the panel and taken Jan. 2, 2011, shows that the head quickly grew much larger and a tail began to trail a great distance eastward. Some of the clouds moved south and got caught up in a current that flows to the east (to the right) relative to the storm head. In the top right of the panel, this tail, which appears as slightly blue clouds south and now west (left) of the storm head, can be seen encountering the storm in the Feb. 25 image. The April 22 image, in the bottom left of the panel, is one of Cassini's last views of the storm when it still had a recognizable head. In this view, the tail is south of the head and is well established by this time. The May 18 view, in the bottom middle, shows only the storm's tail. The head still existed at this time, but it is beyond the horizon and out of the field of view here. Between the time of the May 18 image and the next image shown here (from Aug. 12), the head of the storm was engulfed by the part of the storm's tail that spread eastward at the same latitude as the head. The Aug. 12 image, in the bottom right, shows that the head has lost its distinct identity and is now just part of the jumble of the storm. Also visible in these images are several of Saturn's moons and the shadows cast onto the planet by moons. For example, the planet's second largest moon, Rhea, can be seen in the Feb. 25 view. The Feb. 25 and Aug. 12 views are true color. Images taken using red, green and blue spectral filters were combined to create these natural-color views. The Dec. 5, Jan. 2, April 22 and May 18 views are nearly true color. Because a visible red light image was not available, an image taken using a spectral filter sensitive to wavelengths of near-infrared light centered at 752 nanometers was used in place of red. So the color is close to natural color, but it is not exact. These views were acquired at distances ranges from approximately 1.4 million miles (2.2 million kilometers) to 1.9 million miles (3.0 million kilometers) from Saturn and at sun-Saturn-spacecraft, or phase, angles of 41 degrees to 99 degrees. All the views are set to a scale of 101 miles (162 kilometers) per pixel. The Cassini-Huygens mission is a cooperative project of NASA, the European Space Agency and the Italian Space Agency. NASA's Jet Propulsion Laboratory, a division of the California Institute of Technology in Pasadena manages the mission for NASA's Science Mission Directorate, Washington. The Cassini orbiter and its two onboard cameras were designed, developed and assembled at JPL. The imaging team is based at the Space Science Institute, Boulder, Colo.